DNA, a molecule famous for storing the genetic blueprints for all living things, can do other things as well. In a new paper,* researchers at the National Institute of Standards and Technology (NIST) describe how tailored single strands of DNA can be used to purify the highly desired “armchair” form of carbon nanotubes. Armchair-form single wall carbon nanotubes are needed to make “quantum wires” for low-loss, long distance electricity transmission and wiring. Single-wall carbon nanotubes are usually about a nanometer in diameter, but they can be millions of nanometers in length. It’s as if you took a one-atom-thick sheet of carbon atoms, arranged in a hexagonal pattern, and curled it into a cylinder, like rolling up a piece of chicken wire. If you’ve tried the latter, you know that there are many possibilities, depending on how carefully you match up the edges, from neat, perfectly matched rows of hexagons ringing the cylinder, to rows that wrap in spirals at various angles—”chiralities” in chemist-speak. 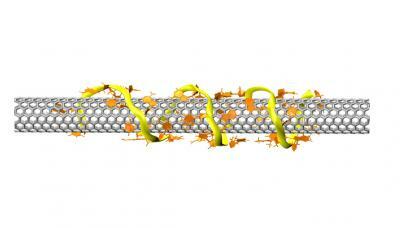 Chirality plays an important role in nanotube properties. Most behave like semiconductors, but a few are metals. One special chiral form—the so-called “armchair carbon nanotube”**—behaves like a pure metal and is the ideal quantum wire, according to NIST researcher Xiaomin Tu. Separating one particular chirality of nanotube from all others starts with coating them to get them to disperse in solution, as, left to themselves, they’ll clump together in a dark mass. A variety of materials have been used as dispersants, including polymers, proteins and DNA. The NIST trick is to select a DNA strand that has a particular affinity for the desired type of nanotube. In earlier work,*** team leader Ming Zheng and colleagues demonstrated DNA strands that could select for one of the semiconductor forms of carbon nanotubes, an easier target. In this new paper, the group describes how they methodically stepped through simple mutations of the semiconductor-friendly DNA to “evolve” a pattern that preferred the metallic armchair nanotubes instead.